Purchasing an antique engagement ring is a beautiful way to incorporate a love of the past into your dreams for the future. If you love antique jewelry and want a ring that you won't see one anyone else's finger, an engagement ring that's a century or more old is the perfect choice. The key is knowing how to shop for this unique ring. Buying an antique engagement ring is different than purchasing a new ring at your local jeweler. Instead of walking in and picking a new ring from among the many options, you'll need to search a bit to find the design that's perfect for you. Fortunately, you can find great rings at local antique stores that specialize in jewelry, as well as a number of online retailers. Erstwhile Jewelry Company is a great place to begin your search. This New York-based store specializes in vintage and antique fine jewelry, especially engagement rings. You'll find gorgeous designs from the Victorian, Art Nouveau, and Edwardian periods. Many designs feature diamonds mixed with other precious gems. Prices range from about $1,000 for a gold Victorian ring with tiny diamonds and pearls to several thousand dollars for rings featuring larger, high-quality diamonds. Reviews of Erstwhile Jewelry Company on Yelp are overwhelmingly positive. 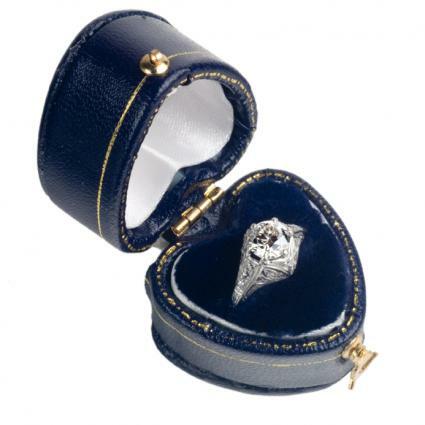 Many past customers praise the knowledgeable staff and excellent service and selection, as well as the gorgeous rings. Based in Houston, Texas, Past Era Antique Jewelry is a treasure trove of beautiful engagement rings from days gone by. There are spectacular pieces from the Georgian, Victorian, and Edwardian eras, as well as rings from the Art Nouveau, Belle Epoch, and Arts and Crafts design movements. You can search by era or simply browse the selection of engagement rings from all periods. Most rings cost between $3,000 and $20,000, but some with very large diamonds cost as much as $80,000. Users on Yelp gave very positive reviews to Past Era Antique Jewelry, citing the pleasant shopping experience, helpful staff, and great selection. Brilliant Earth is an eco-friendly jeweler based in San Francisco, California. In addition to responsibly-sourced diamonds, they specialize in antique engagement rings from all eras. This is a great source for Victorian and Edwardian designs, many of which feature other precious gems mixed with diamonds. Prices are affordable, with most engagement rings ranging from around $1,500 to $4,000. This store has a great reputation, with more than 150 five-star reviews on WeddingWire. Past customers praise the helpful and friendly staff, the financing options, and the selection of antique rings. Leigh Jay Nacht is a New York jeweler who specializes in antique engagement and wedding rings, as well as reproductions made from antique designs. There are dozens of designs from all eras, and each item is clearly marked as a genuine antique or a reproduction piece. Prices range from under $400 to over $20,000, depending on the quality and weight of the diamonds and other precious gems. Each ring comes with an appraisal certificate. WeddingWire reviewers have many positive things to say about Leigh Jay Nacht, Inc. They especially love the great personal service and the selection of ring designs. Breaking the antique engagement ring shopping experience down into manageable steps can help you make sure you get a ring you'll love for years to come. Georgian - Extending from 1814 through the 1830s, the Georgian era represents a period of engagement rings with multi-stone settings. Many also have elaborate swirling designs in the ring shank. Some feature a mix of gemstones, but most are exclusively diamonds. Victorian - Victorian engagement rings typically date from about 1837 through 1901, and they can encompass a number of popular styles. You'll see the sweeping lines of the Art Nouveau era, the simple nature motifs of the Aesthetic movement, and the over-the-top glitz and glamor of the Belle Epoch. Edwardian - Dating between 1901 and 1910, the Edwardian era generally saw simpler designs for engagement rings. Many featured geometric stones and tapered side shanks influenced by the Arts and Crafts movement, but there were also rings with diamond-studded leaf designs and a mix of precious gems. Materials - Just like a contemporary or vintage piece, part of the value of an antique engagement ring is in its materials. The clarity, color, cut quality, and carat size of the diamond will influence the price, as will the other gems and precious metals that are incorporated in the design. A ring with a large, high-quality diamond is always going to be worth more than one with a lower quality gem. Condition - The condition of the engagement ring is another important factor. Over time, stones can loosen and get lost, and gold can become dull and scratched. Improper restoration can decrease the value of the ring as well. The most valuable antique ring will have all its original stones and have been lovingly and carefully restored by a professional jeweler. Emblematic of its era - A ring that is emblematic of the era when it was created is also very valuable. For instance, an Art Nouveau ring should have popular motifs for the 1890s, such as floral engravings and/or images of women with flowing hair, and fluid lines. Provenance - Provenance, or proof of a ring's history or back story, can add a great deal to its value. This might take the form of the original jeweler's receipt, a letter or diary mentioning the ring, or a photograph depicting the ring on the hand of the original owner. Rarity and desirability - A ring that is 200 years old is far more difficult to find than one that is 100 years old. Similarly, a ring featuring an old-fashioned diamond cut or the work of a noted jeweler may be rarer and more desirable. These factors can make a ring more valuable - and therefore more costly. You'll also need to set a budget for your ring before you begin shopping. This prevents you from falling in love with a piece that is out of your price range. Decide how much you can afford to spend and limit your browsing to rings that fit within this range. After you've decided on a style and budget and selected a ring you love, it's time to purchase your ring. Work with a reputable jeweler who will allow you to return your ring if it doesn't meet with your expectations. This is especially important when buying your ring online, since you'll need to have an independent appraisal. Unfortunately, some retailers may sell reproductions of antique rings and claim they are genuine antiques. Some stores may misrepresent the materials in the ring or the age of the jewelry. Sometimes, a poor restoration effort will have decreased the value of the ring. These are all reasons that it's always important to get your antique ring appraised by an expert. Call local jewelry stores to see if they have anyone on staff who is certified in antique jewelry appraisal. Talk to a local antiques appraisal service to find out if they have anyone on staff who specializes in jewelry. Ask if there are any certified appraisers at your local antique store. Go to a local antique market and find a vendor who specializes in antique jewelry. If he or she can't help you, ask for a recommendation of someone who can. When you buy an antique ring, you're purchasing a piece of jewelry that was sized to fit a specific person's finger. This means it very likely will need to be resized before you can wear it. Before you decide to keep the ring, it's essential that you make sure it's a design that can be resized. In general, this means it has a plain area on the back of the shank that a jeweler can use to add or remove metal. Rings with engraving or gems all the way around the shank cannot be resized without harming the design. If you're in doubt, take the ring to a local jeweler to find out more. Is an Antique Ring Right for You? Do you work with your hands? If the ring will be getting a lot of abuse from your work or hobbies, an antique might not be the best choice. 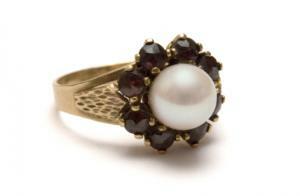 Many of these antique rings are delicate works of art that can be damaged by rough handling. Is the ring's history important to you? If it is, a genuine antique is the way to go. If you just love the style, a reproduction will suffice. Do you want the responsibility? Buying an antique ring means being responsible for a small piece of history. Losing or damaging any engagement ring is distressing, but this is especially true with an antique. However, for some brides, this responsibility adds weight and importance to their wedding jewelry. Buying an antique engagement ring is a little more complicated than purchasing a new piece; however, you get more than just a lovely item of jewelry. Your engagement ring will be imbued with the style and history of another era, making it a valuable and unique statement about your love.